The UMD football team has faced a number of challenges in the first few weeks of the season. The Bulldogs were forced to give sophomore quarterback Ben Everhart his first collegiate start on Sept. 16 against MSU-Mankato after injuries to quarterbacks Mike Rybarczyk and John Larson the week prior. Everhart, who passed for 325 yards and 2 touchdowns against the Mavericks, said he felt confident from the opening snap. Junior wide receiver Jason Balts, who had 8 catches for 130 yards and a touchdown in the 38-23 loss to MSU-Mankato, said the wide receivers take responsibility for taking pressure off the quarterback. Even though four Bulldog quarterbacks have seen playing time this season, Balts has taken notice of their leadership each day. While the wide receiver acknowledged the situation the team is in, he said that the leaders of the team will be put to the test. In UMD’s losses against Sioux Falls and MSU this season, they ran for -19 yards and 59 yards, respectively, while rushing for 249 yards in their win at Upper Iowa. Everhart knows the importance of establishing a balance on offense early in the game. “Running the ball opens up passing too and vice versa really so we like to control the line of scrimmage and be able to run the ball,” Everhart said. 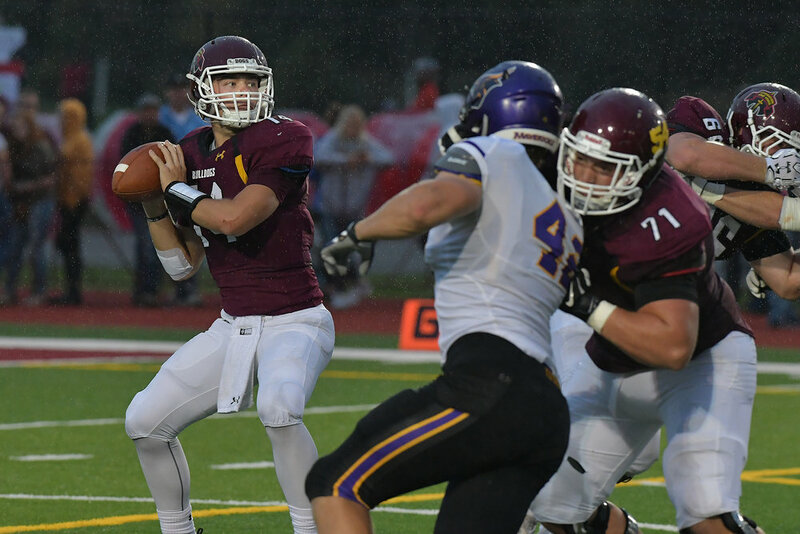 With a record of 2-2, the Bulldogs know that one more loss would almost certainly eliminate them from making another trip to the NCAA Division II playoffs. While the team is aware of the situation, the players are simply taking it one game at a time. Everhart has no shortage of confidence in himself as he prepares for his next chance to play under center. The Bulldogs will host NSIC rival St. Cloud State Huskies after a short week on Thursday, Sept. 28 at James S. Malosky Stadium.